would be commissioned by the Meeker Chamber of Commerce to commemorate an animal that is so connected to the history of the area. Theodore Roosevelt, the 26th president, hunted mountain lions in Rio Blanco County. In fact, for a long time he held the world record for the size of mountain lion he shot here. The 9.5-foot tall mountain lion sculpture created by Kobald will be dedicated at a public ceremony at 5:30 p.m. Friday at the corner of Fifth Street and Highway 13 in Meeker. Chamber Executive Director Suzan Pelloni is hoping for Chamber-like weather on the day the big cat will be permanently displayed. Pelloni said the Chamber of Commerce was excited to have the project culminate with Friday’s dedication. “This public art project originated just over a year ago with the intention of beautifying Market Street (Highway 13) as well as to lead people into Meeker’s historic downtown,” Pelloni said. Working from a photograph, Kobald created the bronze mountain lion sculpture, which he started working on last spring. In addition to being an artist — Kobald teaches watercolor painting for Colorado Northwestern Community College — he is a professional guide for hunting and fly fishing. “I’ve been guiding here in the valley for about 15 years,” he said. As an artist, Kobald is proud to have been involved in the mountain lion project. “It’s an honor,” said Kobald, who also did a painting of a Ute dancer that was used in the poster for the first-ever Smoking River Powwow in July. The mountain sculpture was cast at a foundry in Paonia. The bigger-than-life-size statue was designed to stand out. The project is part of the chamber’s community beautification effort. Pelloni said the public art concept originated from a Colorado Revitalization Partnership Program in 2005. “The program’s mission was to assess opportunities through discussion and interviews with key stakeholders and strategize best ‘next steps’ to sustain and expand Meeker’s retail businesses,” Pelloni said. Kobald also credited First National Bank of the Rockies, which owns the property where the statue will be located. “They are allowing us to put it there,” Kobald said. The feeling is mutual, said Kim Brown, bank manager. Kobald started out by first creating a nine-inch-tall model of the mountain lion sculpture, and then he made a 23-inch piece. He donated both of those to the chamber to sell to help raise money for the project. So far, more than $37,000 in donations has been raised. An additional $4,000 is needed to finish paying for the project. Kobald comes by his artistic bent naturally. “My father is also a sculptor,” he said. Kobald’s parents will be on hand for the dedication. This isn’t the first big sculpture Kobald has done. He also created a seven-foot-long snapping turtle, which weighed 650 pounds, that is on display in a public park outside of Chicago. And he is doing a red-tailed hawk for Angelo State University in San Angelo, Texas. But doing the mountain lion sculpture was different for Kobald, because it was for the town where he lives. 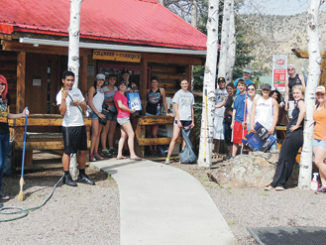 Twenty-seven of the 42 members of the Meeker High School senior class took part in a community service project Tuesday morning at the Meeker Chamber of Commerce.